As I sit and write this blog I realize I am writing about style and approach to a specific task that many of you have been doing for many years. So I will start with this disclaimer – I will share my experiences with you on many successful repointing projects that involved lime putty mortar and most required no washing after wards except an occasional vinegar quick rinse to remove the white film from red brick units. I have made mistakes along the way and worked over the years to attempt to figure out what is the best practice approach to this task of mortar replacement called repointing. Repointing, unlike tuckpointing, requires the full preparation of the joints to a depth of 2 to 2-1/2 times the width as discussed in yesterdays post. The American version of tuckpointing is only a skim coating of cement-based mortar over the top of existing mortar joints without the removal process (Chicago). The British version of tuckpointing is where a mortar joint is actually made to the same color as the units and a grapevine line is established in the center of the joint and tucked with a different color and mixture of mortar – true tuckpointing. This true tuckpointing is remarkably difficult to learn but in the end it makes brickwork appear straighter and rubble stonework look like it was laid up in ashlar units. Mixing lime putty mortar is straight forward. You mix the putty into the sand placing the sand in the wheelbarrow first. Create a hole in the sand for the putty and place the putty into the hole and start to twist and knead the material together. What is interesting is that you do not need additional water during the mixing process; there is enough water in the lime putty to give you a good brown-sugar consistency for repointing. If you are laying brick you can add a small amount of water to create a spreadable mortar. A good repointing mortar should not be able to be spread with a trowel, if it is, than you have too much water in the mixture. If this occurs all is not lost, simply set the material aside on a dry sheet of plywood and allow the excess water to run off (be absorbed into the wood) until you get the desired consistency. This may take several days. Pre-soak the wall with water. Be sure to get the water between the units and back into the existing original mortar joints. I have had projects where the water pre-soaking process never made it back into the joints – the sprayer was held too far away from the wall surface and while the unit faces received water the joints remained dry – especially the tighter joints. To ensure that you are getting the water back into the joints run the sprayers right on the walls and into the joints filling them with water. Allow the water to absorb into the wall materials and become Saturated Surface Dry (SSD) – no standing water to the touch, no drips, no glistening or shining if viewed from an angle – usually takes 8 to 10 minutes depending on the rate of absorption. You are now ready to start placing the mortar material. It is most important that your repointing tools fit between the masonry units to enable you to compress the mortar back to the original material. If your repointing tools are too wide you will stain the face of the masonry as you attempt to get the material back into the joint and you will not get the necessary compression required for a good job. You may need to alter your tools by using a bench grinder to create thinner repointing tools. Most big box stores only carry 3/8 inch size even though ¼ inch sizes are available. Work from a hawk. If you are right-handed, work from right to left, on a slight angle, leading with the tip of the repointing tool. Overfill the mortar joints past the surface of the masonry units at least ¼ inch. Allow to dry and become thumbprint hard. Scrap away the excess mortar using a margin trowel and follow the contours of the masonry edges if required. Match the mortar joint profile of the original work. Stipple brush finish the joints by beating the faces with a churn brush – opening up the surfaces to expose the aggregate and create a texture that will encourage prompt evaporation of water and rapid carbonation as the mortar cures. Protect the mortar for the first 24 hours after placement from wind driven rain and direct sunlight. Keep the material moist – spraying the entire wall with water three times per day for the first three days after application. The material carbonates as it goes through wetting and drying cycles – a minimum of at least nine (9) cycles. Do not allow the mortar to dry out too quickly. 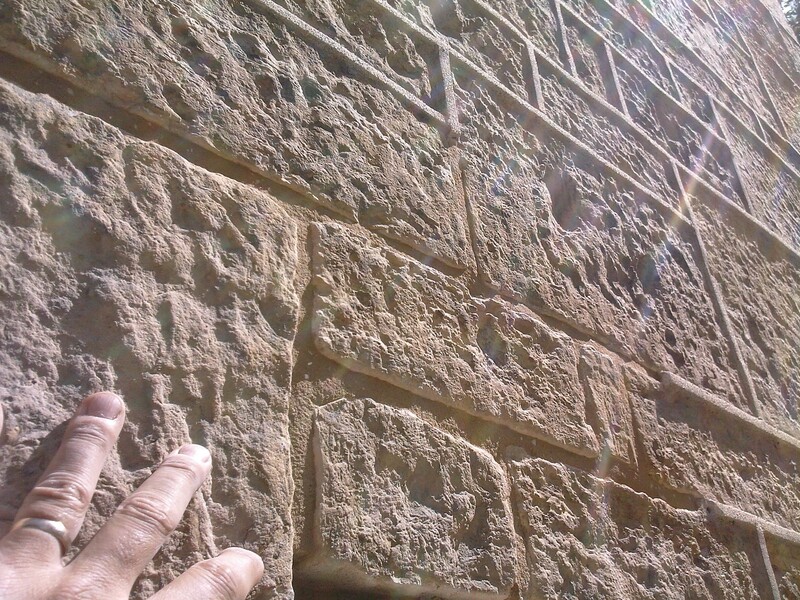 Repointing into hot or warm masonry units (south elevation) during summer months is not recommended. The masonry units simply will draw out the water from the mortar to quickly as the temperature rises reducing the chances for proper curing and carbonation to take place. Part of the solution to the problem of moisture migration is allowing the water to have its way. In above grade walls, that means letting it go through the wall, then redirecting it through flashing and weep holes if possible, and most importantly, using a breathable mortar that is more porous than the brick or stone. Below grade, keep water from resting on the outside of the foundation walls in saturated soil conditions. Create a drainage system, a way for the water to move away from the foundation, perhaps installing perforated foundation tile at the base footing of the wall with gravel fill. Again, check gutters and downspouts to ensure they are clean and take water away from the wall, extending downspouts at least three feet past the elbow at grade level is a good idea. Grade the soil and pavement materials around the building to encourage water runoff and avoid collecting and pooling near walls. 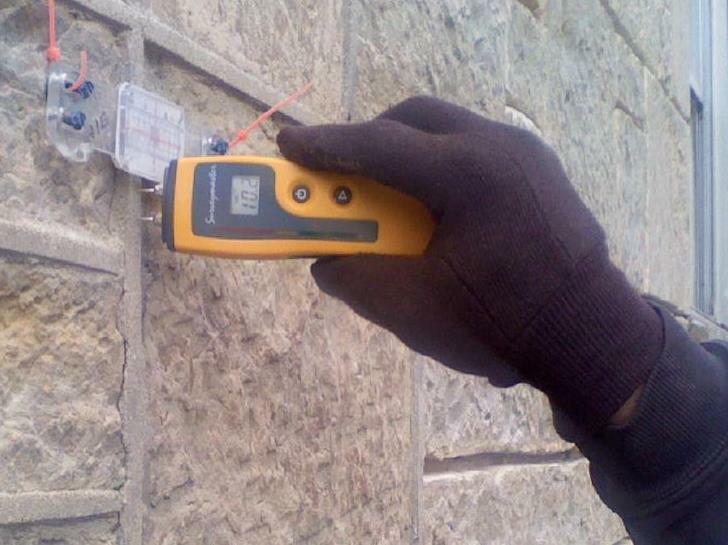 Detecting trouble in advance – The use of a moisture meter can sometimes be helpful in determining a baseline for acceptable moisture content in a historic masonry walls. Because not all masonry walls are created or built equally, all have varying levels of moisture depending on conditions. What is important in establishing a baseline is looking for the wall sections that are performing well. In these areas, take readings to compare to areas with deteriorating brick or stone. This will put you on a specific path toward understanding what to expect in the future. Also consider choosing breathable mortar materials like lime putty or hydraulic lime blended with coarse aggregate particles – often the vary material that has turned to dust over the past 100 years. Do not try to make it stronger or better. Just match the old lime mortar and move onto the next project. If the original historic mortar has turned into dust or is falling out of the wall, it is likely a lime mortar. It has done the hard work of absorbing more water than the brick over and over again and now needs replacement. The brick or stone is generally preserved in these cases. The new lime mortar replacement mixture should match the old mortar and perform as the old mortar did – it to will turn to dust and fall out of the wall in the next hundred years, giving the next generation something to fix. Most people don’t realize that lime particles are said to be some 500 times smaller than portland cement particles. This might explain, in part, why some lime mortar applications for repointing get so messy with mortar on the faces of the stonework – and yes, very difficult to remove especially the longer the lime mortar sits on the stone. The key in delivering a clean project, one that needs minimal cleaning (just with a small brush and water at the edges of the stone) is water content of the repointing mortar when being applied. The consistency should be like that of stiff compacted brown sugar like you find in the kitchen cabinet. Yep, just like that. The feeling, the moisture content, and the compaction power. Mortar made to this consistency will not stick to the surfaces of the stonework and cannot be dragged along the top causing a stain from the hawk being pressed against the wall. You get a cleaner wall and the chances of shrinkage cracks are reduced as the mortar cures. But moisture is important when repointing a wall. Bond strength is delivered during the application when a thoroughly soaked wall (with water) is allowed to partially dry-out and become surface-saturated-dry or (SSD). The SSD condition gives the dry mortar a bond potential with the advancement of each masons pressurized push against the material to the back of the joint. This is why it is so important that the masons repointing tool be sized to fit within the joint to allow for this compression. 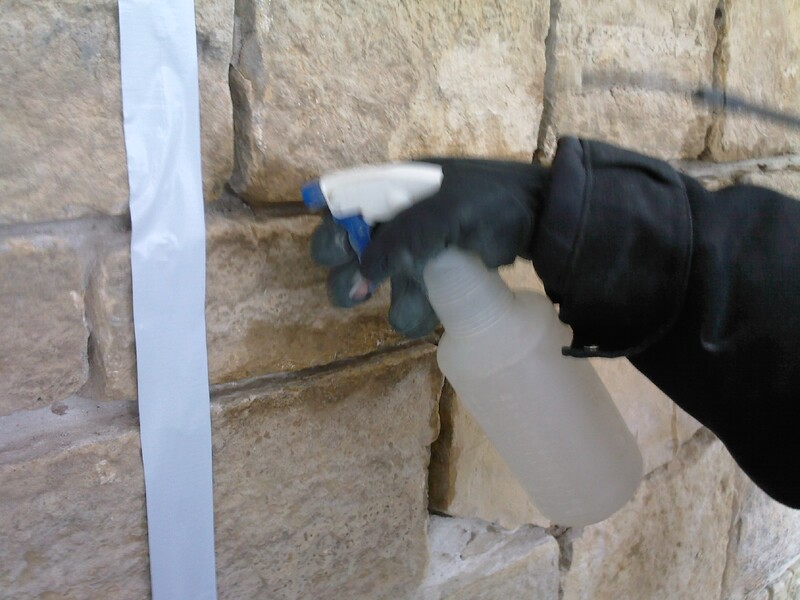 I have seen a trend in recent years to rely on washing down the repointed walls with a light solution of an acid-based cleaner to remove the mortar stains from the stone surfaces. 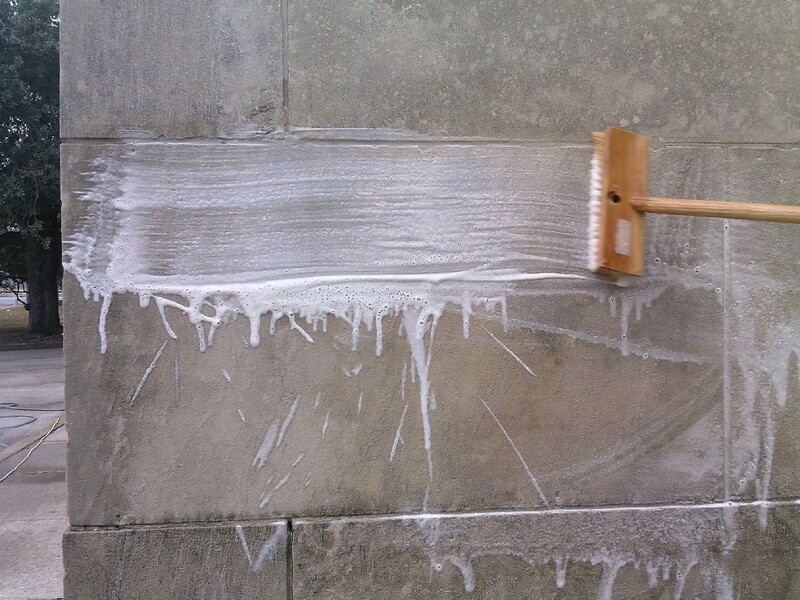 Problem is that the cleaner also cleans the mortar and dissolves the binder paste from the surfaces. While some in the industry call this aging the mortar, because it exposes the aggregate and gives the appearance of an old mortar joint. Well, you would get that appearance anyway if you waited 10 years as the lime paste naturally wears off the surface of the aggregate particles. So, in fact, what you are doing in washing the wall down is giving the customer a used wall – a clean wall, but a wall that has been exposed to accelerated weathering is how I look at it. I figure you rip off at least 10-15 years of life cycle performance from the face of a mortar joint by washing it down with an acid-based cleaner. Seems the evidence is clear that the lime mortars do not withstand a cleaning as well as portland cement-based mortar mixtures. What makes things much worse is that lime mortar is very absorbent to water by its natural ability to transfer water in and out through evaporation which often causes the cleaners to penetrate deeper into the joint surface weakening the material even further. The story I tell in my masonry seminars is a fun one to illustrate the point. It would be like selling someone a brand new set of tires for their truck and make them pay full price for them, but just as they are ready to drive away, you tell them, “Let me use your tires for say 20,000 miles first, then I will give them back to you” – essentially selling them used tires for the price of brand new ones. Don’t sell used lime mortar.